DEC invites the public to comment on a proposed remedy to address contamination at a portion of the K-Wythe Ave. Station Site (Brooklyn), within New York's State Superfund Program. Public comments about the proposal will be accepted through December 30, 2018. A public meeting also will be held, Wednesday, December 12, 2018 at 6:30 PM at the Bushwick Inlet Park Headquarters, Kent Ave. and N. 9th St., Brooklyn. Click the web link above at "Additional Information" to learn about the proposed remedy, how to comment, and the public meeting. Please note that the public comment period originally scheduled to end on December 15, 2018 has been extended through December 31, 2018. DEC invites the public to comment about a proposed remedy to address contamination related to the 1101 Prospect Avenue Site (Westbury, Nassau Co.), within New York's Brownfield Cleanup Program. Public comments about the proposal will now be accepted through December 31, 2018. Create colorful artwork using real and replica fish in the style of gyotaku, the Japanese method of fish printing. Paper will be provided but participants can also bring a white shirt or bandanna. Materials fee: $3/free for Friends members. Registration required; call 716-683-5959. To submit your photography and/or artwork please complete artist information form (PDF, 41 KB), and send it with your artwork attached to arborday@dec.ny.gov. What better way to kick off the New Year than by getting a jump start torching off those holiday calories in the great outdoors. Join one of the dozens of sponsored hikes held each New Year's Day on public lands across the Empire State. Staff from DEC and State Parks, along with volunteers at many sites, lead these family-friendly walks and hikes, which range from one to five miles depending on the location and conditions. Check out the great hikes available. Join local bird experts for our 38th annual New Year’s Day survey. Seventy-one different species have been found at Five Rivers on Albany’s “First Morning,” and the birds found over the decades of this long-term study show interesting range changes for many species. Bring binoculars if you have them. Dress warmly. If severe weather is forecast, call on Monday, December 31 to confirm the event will be held. Ring in the New Year with a snowshoe hike led by a DEC Forest Ranger, who will discuss how to prepare for any outdoor adventure. We will hike even if there is no snow. Snowshoe rental: $5/$2 for Friends members. Registration required; call 716-683-5959. Phone: (518) 402-9660, Fax: (518) 402-9029, E-mail: edward.hampston@dec.ny.gov. Notice of Public Comment Period for the 2018 Citywide LTCP Modification to Order on Consent between the City of New York and the New York City Department of Environmental Protection (NYC DEP) and the New York State Department of Environmental Conservation (NYS DEC), DEC Case # CO2-20110512-25, a.k.a. NYC CSO Order. 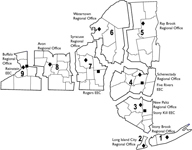 Counties: New York (Manhattan), Richmond (Staten Island), Kings (Brooklyn), Bronx (Bronx) and Queens. The NYC CSO Order includes various milestones and projects associated with abatement of Combined Sewer Overflows within New York City. Pursuant to Paragraphs XVI.A and D.3 of the 2005 NYC CSO Order, the NYS DEC is required to publicly notice "[i]n the event of a substantive and significant modification to the construction compliance schedules provided for in this Order." The 2018 Citywide Long-Term Control Plan (LTCP) Modification to the NYC CSO Order consists of change to the following Appendix A milestone VIII. City-Wide LTCP, A. Submit Approvable City-Wide LTCP. Public Comment Period: The 30 day comment period commences on December 5, 2018 and concludes on January 4, 2019. Comments may be submitted to the NYS DEC Contact listed above. DEC invites the public to comment about a proposed remedy to address contamination related to the Greenpoint Marina Site (West and Oak Streets, Greenpoint, Brooklyn), within New York's Brownfield Cleanup Program. Public comments about the proposal will be accepted through January 4, 2019. Public comments about the applications and draft work plans must be submitted by January 5, 2019. At Five Rivers, we put up bird feeders in winter to help our wild birds, and to attract them for people to watch. Come learn about the benefits of feeding the birds and build a snowman bird feeder. Space is limited; call to register by Thursday, January 3. Following a potluck lunch, there will be a discussion and display of outdoor equipment. Depending on snow cover, a guided snowshoe or walk will begin around 1:30 PM. At least six inches of snow is required for rented snowshoes. Please dress for the weather and wear appropriate footwear, including winter-traction cleats, if needed. Snowshoe rental $5, free for Friends members. The public is welcome to attend any part of this event.